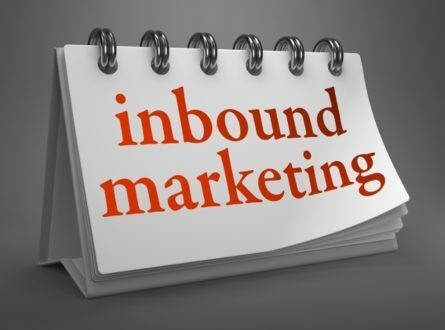 How can Inbound Marketing generate more leads consistently? Unlike outbound marketing, inbound does not need to fight for potential customers attention. By creating content designed to address the problems and needs of your ideal customers, inbound marketing attracts qualified prospects and builds trust and credibility for your business. So what are the benefits of inbound marketing for lead generation, as a part of a broader marketing strategy and investment? Inbound methodology is proven to increase digital online engagement from targeted prospects, throughout the stages of landing page visits to contacts to converting to customers. The ability to track and report allows for an automated lead generation method that reduces inefficiencies and the higher costs associated with traditional outbound marketing methods. As well as the cost savings, inbound marketing ensures time and people resources are used more efficiently and with higher rates of success. Inbound process offers content-driven insights to help make ongoing assessments on digital marketing campaign budget and ROI across different social media channels. Once published, online content does not have an ‘expiry date’, and with some repurposing and shaping, the material can be designed to appeal on an ongoing basis to the target audience. The most common challenge in the lead generation process is to gain more new contacts in order to generate more qualified lead conversions. Customizing content and writing towards a target persona or audience can initiate a new source of contacts and leads, including from new markets where you had no previous reach. Typically inbound content development needs to be an ongoing, organic approach to lead generation marketing, which complements other forms of marketing activities and channels. We recommend testing a campaign across three to six months in order to gain momentum, target, and track to establish a benchmark of KPIs and/or lead generation. 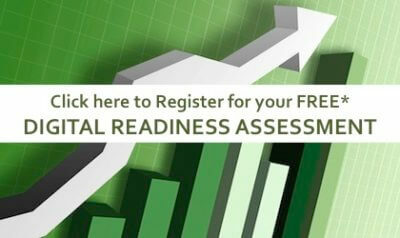 Once the campaign and internal process is refined, then firmer KPIs can be determined. Traditionally the cost of outbound telemarketing methods present a low rate of return, is resource intensive, and largely timing based for a push approach. Digital marketing automation is the vehicle for delivering an inbound marketing strategy that eliminates the higher overheads of a traditional outbound call centre resource. It is less invasive and more personalised, and better suited to modern consumer behaviours throughout the buying journey. Automated tracking of marketing activity provides historic reporting as well as selected and more personalised outreach strategies to attract the ideal prospects. These days, the key to marketing effectiveness is utilising data analytics to determine what is working and what is not, and presenting the data to enable management to make informed decisions about sales and marketing engagement, resourcing and budgeting process to drive growth. Ongoing research supports the suggestion that inbound marketing automation generates a higher ROI than traditional outbound campaigns. 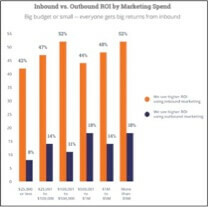 Companies are 3x as likely to see higher ROI on inbound marketing campaigns than on outbound. 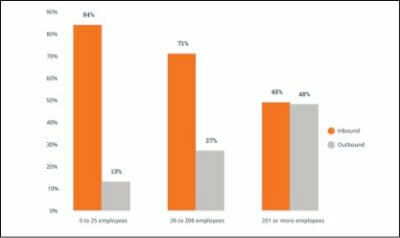 Inbound marketing is the dominant marketing strategy for companies with fewer than 200 people and has delivered proven higher ROI. Reduced overheads from sales resourcing. It’s typically challenging enough to secure or allocate budget in a sales and marketing department, or to justify a business case unless there is a guaranteed ROI. The cost of headcount and FTE for experienced sales resources is prohibitive for many, considering both cash flow and timing-wise with a chicken and egg approach… do you build capacity and they will come, or sell first and build sales and marketing resourcing as you need it? A transfer of budget to a highly targeted inbound marketing campaign may alleviate some of these challenges and disconnect, while delivering consistently well-qualified leads without the resource heavy requirements of the traditional outbound approach, and in turn a higher ROI. Inbound creates a smoother lead generation, nurture and handover process across the marketing and sales functions, and a more streamlined buyer’s journey. For an independent review of one leading marketing automation tool in the marketplace, please read Independent Review – Hubspot Marketing Automation Tool. For an obligation free discussion or assessment on how inbound marketing could help boost your lead generation strategy and increase ROI, feel free to contact us at info@alchemiseconsulting.com.